The weather is warming, days are growing longer, and the sunshine beckons even the savviest dieter to hit up happy hour and dine al fresco! We’ve received many questions about whether indulging in a drink or two will tip the scale past the point of no return, and if alcohol’s risks outweigh the benefits. Truth be told, happy hour doesn’t have to be a diet wrecker, as long as you sip with these six helpful tips in our 2019 Skinny-tail Libation Guide. 1) Cocktails are ok –in Moderation! 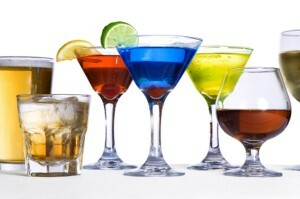 Alcohol in moderation has been shown to provide health benefits in numerous reports. According to the Harvard School of Public Health, more than 100 prospective studies show that moderate drinking can decrease the risk of heart attack as well as death from cardiac diseases. In addition, alcohol raises HDL (“good cholesterol”) and improves blood clot formation and insulin sensitivity. Even better, recent research published in the Archives of Internal Medicine and the International Journal of Obesity found that middle-aged women who drank moderately gained less weight over time than those who never drank. These subjects were also less likely to become obese! When it comes to indulging in a cocktail, the key is enjoying your favorite beverage in moderation and keeping your drink clean and simple. What’s moderation, you ask? About 1 drink for women, 2 for men, and not everyday. Gearing-up for an evening out with friends? Avoid post-happy hour guilt by planning healthy meals leading up to your night out! If you know you’ll be visiting the local bar for drinks and tapas, commit to healthy food and beverage choices throughout the day to avoid booze- induced calorie compensation! Easy tweaks such as packing a nutritious lunch with protein, fiber, and healthy fat will keep you satisfied and prevent arriving to the bar famished. Saving calories throughout the day for drinks is considered old school. When skipping meals and drinking, individuals experience a major crash in blood sugar, which may lead to noshing on unlimited chips, salsa, and bar snacks! When the clock strikes five, have your game plan set before you take the first sip! Approach happy hour knowing your limit for the evening– (Remember: one or two drinks a day for women and men respectively should be your max!) Sip smarter by ordering your favorite beverage along with a club soda or sparkling water. As you sip beer, wine and spirits, alternate with soda water to make your drink last longer and negate alcohol’s dehydrating effects on the body. After you’ve enjoyed your alcoholic beverage, stick to just soda water in a stemmed glass or tumbler– your body and waistline will thank you the next morning, and your friends will think you’re still partying on! If a beverage sounds like an ice cream dessert, most likely the caloric tally matches the tall tropical glass. When ordering drinks out, your best bet is light beer, wine, and mixed drinks made with simple ingredients. (Think: cucumber spirits, vodka or gin with club soda and a twist of citrus, or a brut champagne cocktail garnished with fresh berries). Always know what a true serving should look like to avoid getting ‘over-served’ in more ways than one! An alcoholic beverage should equal just 12 ounces of beer, 5 ounces of wine, or 1½ ounce of distilled spirits. If you order meals with health in mind, don’t stop for beverages. Ask the bartender to customize your drink, and skip sugary mixers, syrups, and frozen concoctions. Looking to feel part of the fun without feeling the effects of the sauce? Order a Mocktail! Many bars, lounges, and trendy restaurants offer “mocktail menus” which feature herbal- infused craft drinks sans alcohol. Not on the menu—ask the bartender to make a mocktail! Being outspoken pays off! 6) Not Sure What to Order? Appetite for Health’s 2014 Skinny-tail Libation Guide will help you sip smart and stick to your diet. Nice and refreshing drinks. Thanks for this dear.